What does the Son of God choose to do with His final mealtime with His disciples? Instead of focusing on the inevitable death that’s to come, He offers other thoughts during this last supper. Jesus chooses to turn the power-scale upside down. 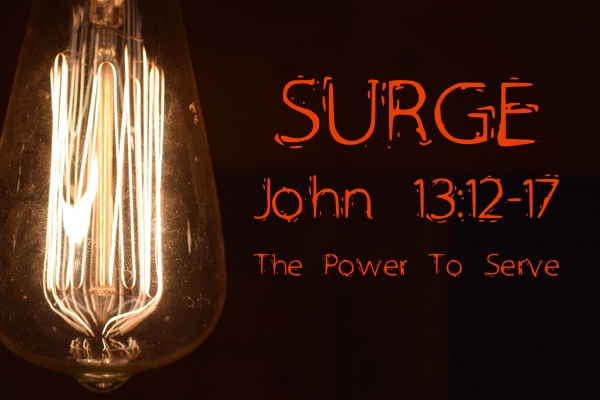 In an absolute power surge, Jesus shows where real power is found: in service. What can we take away from this passage about service? Use power to serve others. The most powerful person/leader to ever live chose to serve and not be served. Even in His soon-to-be-departure where He could have been focused on other things, He chose to focus on others. Jesus’ life was always focused on serving others. He did this all the way to the end. Jesus taught that power is not about being first but being able to be a servant to all. Serving others is what we are called to do. Jesus set the example and then commissioned His disciples to do as He did. It would be one thing if He had not shown us how but He did. Taking up something that would have been left for the lowliest of “servants” to do, Jesus shows that no task or job is beneath Him and therefore nothing should be too “low” for us. Stooping should be natural for disciples of Jesus. Obviously, this requires humility, as well as paying attention for the chances we have to serve others. Jesus looked for opportunities to serve. In our day, people try to avoid as much work and service as possible. But disciples of Jesus are not to be like this. In fact, it’s quite the opposite. Jesus’ followers should be hard-working, ever-looking people who willingly jump at the chance to serve others. Jesus took this opportunity because He saw it as one. Others ignored it or thought someone else should do it, but Jesus realized that this was a great teaching and loving time. Service is an act of love. Disciples look for ways to serve because it’s a way to communicate love. Servants look for ways to elevate others. Jesus took advantage of this time to love His disciples and elevate them in value and importance. He was teaching them that stepping down was essential in learning to lead like Him. From the beginning of His life, Jesus had demonstrated that stepping down would be a huge part of what following Him would be about; He left Heaven and stepped down to earth. Now He is teaching His disciples who have had a hard time accepting who would be on His left and right in Heaven, that following Him is not about elevating ourselves but others. Stepping down to serve others is the first step in the right direction to following Him.